If you are a regular reader of my blogs, you’ll know that I write a lot about finding storage space in the garage that isn’t obvious. One of my favourite places to store things is on the ceiling. Many garages, especially in newly built homes, have high ceilings (10-14 feet) that can accommodate shelving and platforms. To conclude my series of blogs on doing it yourself versus hiring a professional garage company, I’ll talk about ways to create room for storage in this often neglected area of the garage. If you check out the offerings at the big box stores, you’ll likely find limited choice, if any at all. All I’ve found there is a 4-x4-foot steel rack that can be attached to the ceiling. This doesn’t provide much storage space and because it is open on all sides, this makes it difficult to reach items stored in the middle. Also, this option often doesn’t support a lot of weight. If you want to store a lot of items overhead, you can do it yourself by building wooden shelves and platforms. It’s do-able, but you need to be confident in your skills. You need to understand weight and load to ensure it’s safe. You’ll also need the right tools and a vehicle big enough to transport wood and sheets of plywood. The other option is to order overhead storage from an online retailer, but then you run into the costs of shipping and duty if it has to come across the border. Using a professional garage company, such as Nuvo Garage, provides multiple options. 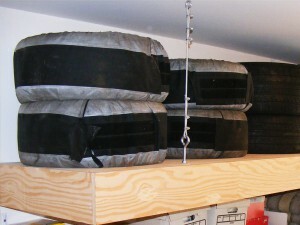 If you want to go with ready-made, we offer a sturdy 4-x-8 foot steel storage rack. 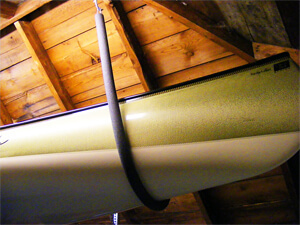 We install it securely into the ceiling joists and the poles can extend from 16 to 34 inches. It will take up to 750 lbs of weight. Steel racks are great for spaces such as over the garage door and for storing seasonal items that you don’t need access to on a regular basis. But they are also limiting because the size will not adjust to use all of the available space. If you choose customized overhead storage, the possibilities are almost endless. Custom overhead wood platforms allow us to design and build shelving that is safe and can store many heavy items such as tires. 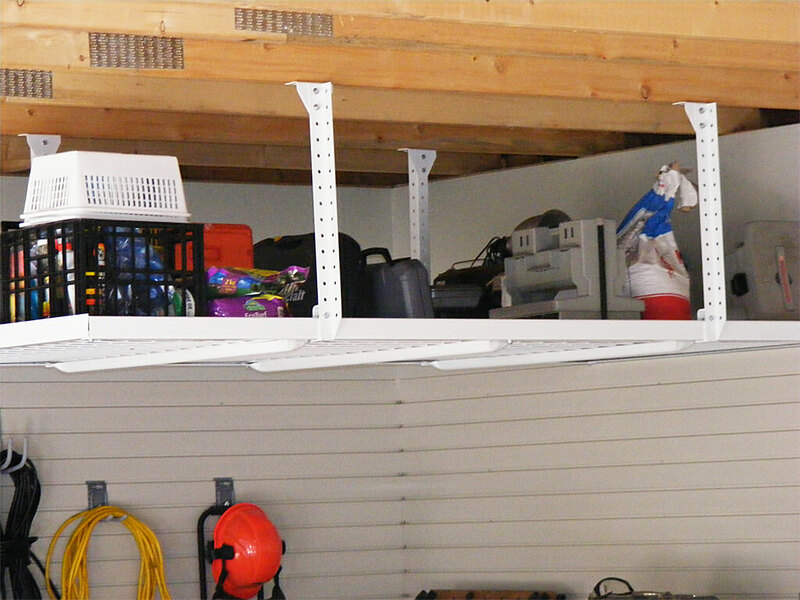 We can design shelving or platforms to make use of odd-shaped corners and maximize cubic storage area of any garage. Our custom platforms are attached to the ceiling with aircraft cable. This allows the shelf to support significantly more weight than anything you could purchase retail. We can then finish the underside with melamine or drywall, and even install pot lights to add focused lighting. If you’re thinking about renovating your garage, decide on your budget and weigh your options carefully. If you’re handy at all, doing it yourself may seem like an obvious choice. But doing a full garage renovation can be as much work as a basement or kitchen, so a professional can help you save time as well as a headache or two. Should I convert my garage into an additional room? Rick built a workshop for my husband, I wanted to surprise him with a space to have his tools all organized. He says it’s the best gift he has ever gotten. Rick was so professional and had it done within a few hours. Our 100% satisfaction and willingness to further use Rick’s services are the highest marking for this skillful tradesman. Thanks again for the job well done or better yet, we want you back, we have more ideas! Rick took a lot of time to discuss the design and every detail at our first meeting. He was also great at managing the project and keeping us up to date at all times. The end result is excellent. Money well spent! We’d seen Rick’s garage renovations and contacted him to ask about an interior project. For 17 years, our unfinished basement work room has been a drafty, cluttered eyesore. Rick transformed it within a week into a pleasant, well-lit and insulated space with attractive storage and quality finishes. I don’t need to keep the door closed anymore! Rick and Ed were truly fantastic. They transformed our overcrowded unusable garage into a place where both cars easily fit. We are enjoying the result of their work very much! Thanks!!! We renovated the inside of the house 2 years ago. This winter Rick and Nuvo Garage did the garage. It has made a wonderful difference to the whole house. Storage of things are now where they should be and we can fit 2 cars in the garage which is fabulous particularly in the winter. I would highly recommend Rick and Nuvo Garage to anyone. We are very impressed with the outcome of our well organized and clean garage now that Nuvo Garage and Rick have completed the job both on time and on budget. Everything has a place and it should be much easier to keep it that way. Also, cleaning the floor takes no time. It’s great to get 2 cars in with lots of walk around room too! They are professional, intelligent and do high quality work. I can park in the garage now, which is really nice after the nasty winter we’ve been through. My neighbours are amazed. We found Rick to be both helpful and knowledgeable in design decisions and formulating an efficient plan for our garage space. Rick gave us a number of ideas that we had not considered and that worked well for our garage. His work kept on schedule and our end result was fantastic. We would recommend NuvoGarage and Rick to anyone considering a garage renovation!! Rick’s work is a live advertising on its own. He has converted freshly built, relatively usable, three car parking garage into the high capacity, clean, versatile storage and two car & boat facility. Copyright © 2019 · Nuvo Garage Inc.